There is a huge misconception that doing crunches will get you a flat, lean waist. This is not necessarily true! There are so many great exercises for the core that will strengthen and flatten! The best way to get the most out of these exercises is to incorporate them into your workouts, or doing a super set of two at the end that target the core differently. These are also great to do in your metabolic conditioning, which I suggest doing at the end of every workout. Anti-rotation press: This is a great exercise to use to get to your deep core muscles, transverse abdominus. Your core is engaging to prevent you from twisting. Super setting this with a lower body exercise like squats, deadlifts or lunges. Tips: Maintain an athletic stance (tall spine, feet shoulder width with a slight bend in the knees). 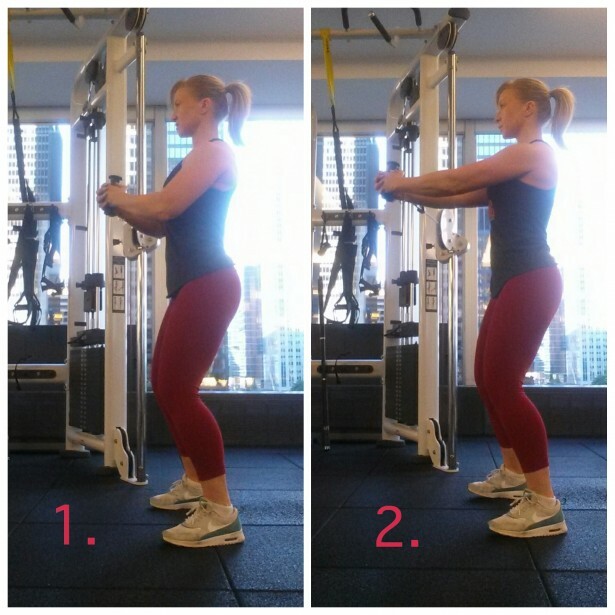 Hold a cable to the front/center of the chest. Pull the shoulder blades back and keep your rib cage up. Hold the cable out half way then press out and back to the half way point. No access to a cable machine? Try using resistance tubing instead! Want some glute activation and create a greater challenge? 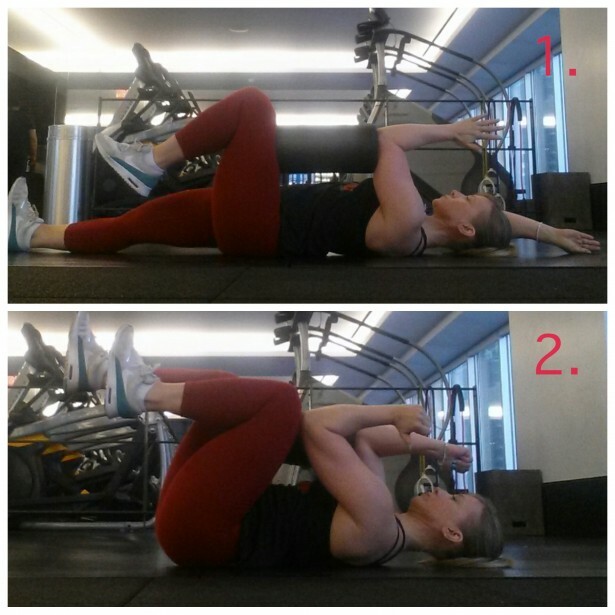 Do this same exercise in a tall kneeling position (on both knees, toes in the floor heel up). You need to squeeze your glutes dramatically to keep yourself in position. Make sure you are not leaning forward or backward. 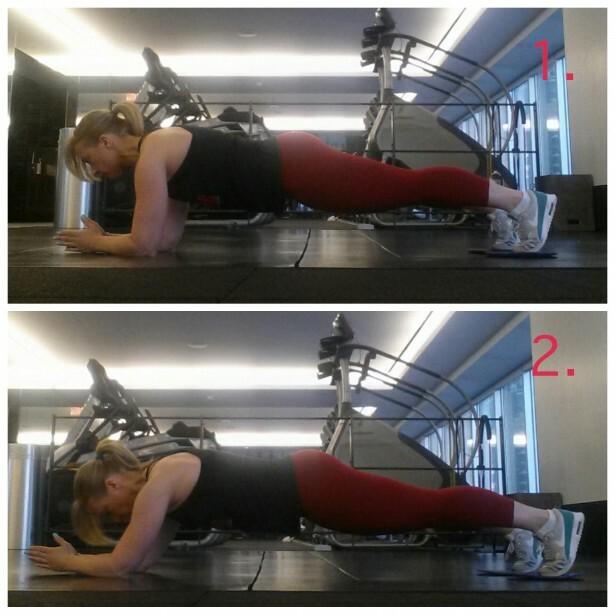 Plank toes slides: Do your hips sag during pushups? Do you do the wave when you do a pushup? Or just looking to have a flatter appearance in the lower abs? This is for you! A great way to engage the lower portion of the abdominal wall! Now who doesn’t want that?! Tips: Maintain a good plank. Don’t let the hips lift up but don’t let them sag either. To prevent this, get in a good plank position, squeeze your glutes tight and pull your belly button in. Try to maintain this throughout the movement. Slide back using your arms and then squeeze the lower abs very tight, pull yourself forward until you are back on top of your elbows, no further. If you start feeling your lower back, then you may not be engaging the lower abs. Reset by squeezing glutes and pulling the belly button in. Use gliders or small towels under your toes. 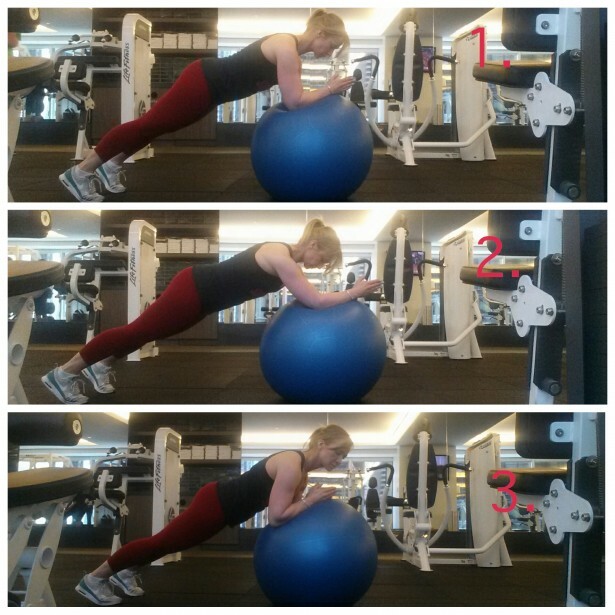 Stability ball plank variations: There are so many variations to a stability ball plank. A couple of examples are arm digs and stir the pot. Both recruit the core differently and give you a great challenge! Tips: For the elbow digs make sure you are on the stability ball in a good plank (glutes tight, belly button pulled in), starting and ending on top of your elbows. Push your arms forward and then pull them back. Your feet remain still. To “stir the pot” again maintain a good plank. Do a circle to one side and keep repeating that, then do the same going in the opposite direction. Make sure the belly button is pulled in and your glutes are tight. If you feel tension in your low back, reset. Stability ball or ab wheel rollout: Using the ab wheel to start may be quite challenging and could cause injury. If this is new to you, start with a large stability ball, then move to a small stability ball and work your way to an ab wheel. This is a great way to get to your deep core muscles. Making these stronger helps give you a flatter stomach! ** This exercise will not be a good option for those with shoulder injuries. Use the SB if you have a very weak lower back. Tips: maintain a good tall posture. Start by kneeling and as you go forward your whole body comes down maintaining a solid plank. Squeeze glutes and pull your belly button in. Let your arms extend out but only as far as you feel comfortable and only as far as you can without losing your core control. As you pull up give your glutes an extra squeeze and pull your belly button in. Think about leading with the upper back not the glutes. Ipsilateral foam roller crushers: Are you someone who can’t give up the crunches? Then this is a good one for you! Another great exercise to superset with the big leg movements and really helps with bracing. You will need a small foam roller for this. Tips: Lay on your back, with one knee up at 90 degrees placing one end of the roller on the mid thigh. Now take the same side elbow and place it on the other end of the foam roller. Squeeze tight! The opposite arm and leg are extended out. Keep your head down and bring your elbow to mid-thigh while squeezing the foam roller on the opposite side. Keep repeating for your desired number of reps. Change sides and repeat. Remember you can’t out train a bad diet! These core exercises assist in creating a strong, lean waist but in order to see really great results, nutrition is a major factor! Training your core should not just be about appearances. Having a strong core protects your spine, improves your activities of daily living and improves balance.